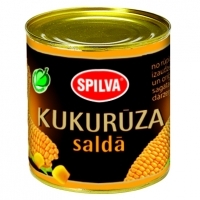 High quality sweet corn. Great supplement for main course dishes. Product is labelled with mark Green leaf and text “Without preservatives” because production process involves method of pasteurization just like home made. Therefore it means that after opening they should be kept refrigerated. Product 100 g contains: energy value – 112 kcal (469 kJ), carbohydrates – 20 g, protein – 4.0 g, fat – 1.4 g, salt – 0.5 g.